Johnstown, PA (June 14, 2018) – Howard Hanna Real Estate services is pleased to announce Fran Pletcher and Allen Thompson as the new owners of Howard Hanna Heritage Real Estate in Johnstown, PA.
Keith Griffith, the longtime owner of Howard Hanna Heritage Real Estate, has officially passed the keys to Pletcher and her business partner Thompson, owner of the Howard Hanna Altoona office – Howard Hanna Johnston Realty Services. Pletcher and Thompson bought the franchise office this spring and are excited and dedicated to growing the business. Pletcher’s career in real estate began in 2001. Throughout her extensive career, she has been a real estate instructor and holds the designations of ABR and CRS. Pletcher is an active member of the community and volunteers with Produce to People, Salvation Army, and Nardecchia Spay and Neuter, just to name a few. She has served on many local real estate committees including multi-list, community service, education, grievance, professional standards, and the board of directors. Pletcher has also served as the president of the Cambria Somerset Association of REALTORS twice. Pletcher’s personal mantra has always been “Expect Success,” and under this new ownership, you can expect to see success from Howard Hanna Heritage Real Estate in Johnstown, PA.
Howard Hanna Heritage Realty is located at 437 Theatre Drive, Johnstown, PA 15094. Fran Pletcher can be reached at 814-266-9521 or 814-442-7804. 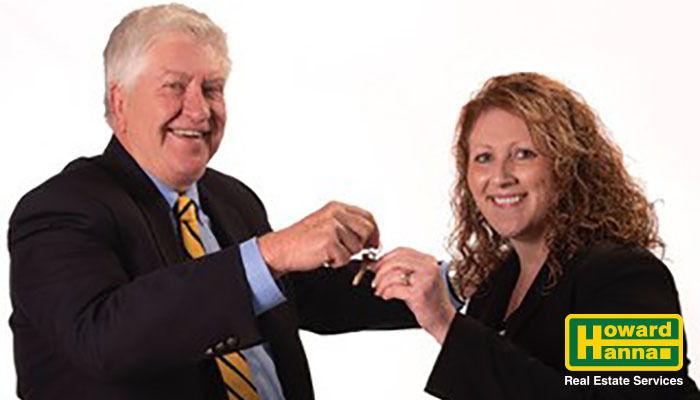 Pictured above, from left to right: Keith Griffith handing the keys to the office to Fran Pletcher. Howard Hanna Real Estate Services is the 3rd largest real estate company in America, the #1 privately owned broker in the nation, and the largest home seller in Pennsylvania, Ohio and New York. The family-owned and operated real estate company specializes in residential and commercial brokerage service, mortgages, closing and title insurance, land development, appraisal services, insurance services, corporate relocation and property management. With 262 offices across PA, OH, NY, VA, MI, WV, NC and MD, our more than 9,200 sales associates and staff are guided by a spirit of integrity in all aspects of the real estate process.